Pressed up against The Lost Continent, the Draconians have called in back up. They have increased the size and power of their convoys. The Scourge continue to share Manticore technology with Forsaken to prevent Draconian dominance. The event starts Thursday, June 14th at 9am PDT and ends Monday, June 18th at 9am. These features will become disabled at the start of the event for their respective worlds. For example, at 9am PDT, relocation will be turned off in World Alpha but will be available for all other worlds. However, you cannot relocate to World Alpha once relocation has been turned off for that sector. Reinforcements is the second event in the Draconian Conquest event cycle. Defeat the Draconian Mega Convoys to earn points which allow you to redeem awesome prizes. Draconian Mega Convoys Targets feature New Turret Carrier, Prototype Kodiak and Prototype Interceptors (with Prototype Weapons), and Draconian Ammo Carriers. These Enemy Ships are equipped with Draconian Prototype Weapons. These weapons have a longer range, deal more damage, and can have special special effects. These weapons have a limited supply of ammunition. When Prototype Weapons run out of ammunition they are reloaded by a Draconian Ammo Carrier, as long as the carrier is in combat it will reload ships on the same map. Prioritizing fire on the Ammo Carriers will prevent the Draconians from being able to reload their Prototype Weapons. These new ships mount powerful base defense turrets. You must destroy the turrets before the hull itself can be targeted, and the turrets cannot be targeted by Torpedos. You will see more of these in the Assault Cycle targets. Restrictions: Must be any tier Assault, or Generalist of at least Tier 7, Caedes is permitted. You can track your completion progress in the Event modal. Defeating a target will mark the completion in the modal. Continuous target completions will count toward future set completions. Once a set is complete, the modal will clear and reset with previously completed targets marked in the modal. Hitting targets that are below your recommended level will result in fewer points. This does not affect the completion bonus for finishing a set. Use the Locator to find targets of all Sets or specific Sets. Sector Threat will not be enabled during the event however you may earn Uranium by reaching certain points thresholds. There are two sources for Advanced Resources (Uranium, Titanium & Base Parts), during the event. The first is Expeditions, which allows you send you fleet out to gather resources. The second is that Advanced Resources will be available in the Event Store for points. The Proto-Centurion is the new “Proto” hull, which will be the ideal ship to be able to solo the Sub Sector Resource Base, and your quickest way to earn Base Parts. Cannon System V and Particle Accelerator Cannon II are the perfect items to start your Proto-Centurion build. The Dark Wing CIC is going to allow you to enhance your Savage and Scorpion Manticore fleets. One of these CIC will improve any fleet of Manticores that you run. The corrosive reload improves Savage fleets. Scorpion fleets benefit from additional time in their Scorpion Shell aura. The speed matching allows Savage and Scorpion ships to effectively work together. The Cheetah Scattergun will help increase the combat speed of fleets, at the cost of the corrosive defense applied by the Panthera Scattergun. The Predator Missiles will help increase the combat speed of fleets, at the cost of the corrosive defense applied by the Stinger Missile. 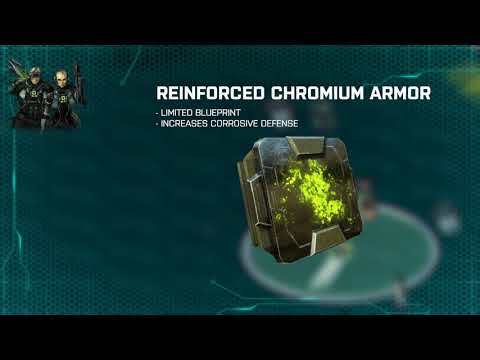 The Reinforced Chromium Armor will allow you to offset some of the loss in defense when equipping the new Cheetah Scattergun and Predator Missile. You earn one shard for this armor for each Draconian Mega Convoy 100 target you defeat. The Reinforced Reactive Armor allows you to increase your penetrating defenses even further with this new special. You earn one shard for this armor for each Draconian Mega Convoy 102 target you defeat. This improvement to Zynthium shells increases the power of your explosive weapons. With increases in projectile speed, splash, and explosive damage, lay waste to your enemies. Protect your building from ballistic attacks with the new Zynth Reinforcements D5-C armor. The Catastrophic Mortar is the first of the Tier 7 explosive turrets. This will allow you to focus your offense in explosive damage. You must redeem an item from the top of either side of the ladder to open the locked store. We have increased the number of 24 hour Manticore tokens from 1 to 2 in the open store. 2 tokens should allow you to refit the Dark Wing CIC to one of your Manticores to increase the power of your fleet.